The All Progressives Congress (APC), Imo stakeholders have said that they have made Gov. Rochas Okorocha politically irrelevant in their determination to rescue the party from imminent collapse in the state. Dr. Theo Ekechi, who spoke to newsmen after a close-door meeting with the APC national leadership on Thursday in Abuja, said the stakeholders had overwhelming pieces of evidence against Okorocha. “There have been wide jubilation in Imo because we have rescued the party from Gov. Okorocha, we have made it impossible for him to get help from anywhere. Ekechi said Rochas’s inaction was responsible for the problems facing the party in the state and the South-East generally. Ekechi alleged that the state was being mismanaged under Okorocha, adding that the governor was running the state like a personal estate. The post We’ve made Gov. 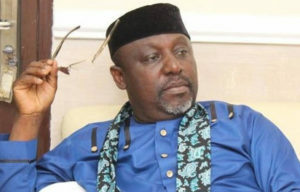 Okorocha politically irrelevant – Imo APC stakeholders appeared first on Vanguard News.